Display Miracle! 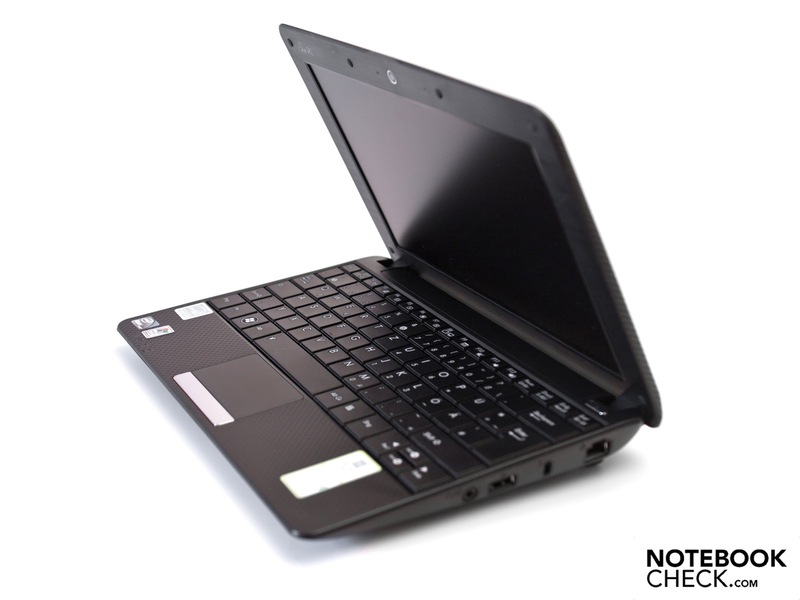 The Eee PC R101 is the new start model in the Eee netbook family. The specs sound very interesting: Intel Atom N450 processor, matt 10.1 inch screen and Windows XP Home for a low 249 euro. We've put the device through its paces. Affordable netbooks continue to find consumers and thus Asus presents a new model, the Eee PC R101, which is made for starters and price conscious users. Especially interesting is the matt 10.1 inch screen and the application of Microsoft's Windows XP Home as the operating system. The plain case is particularly striking in an understatement with a diamond texture. Well-known components are found inside. 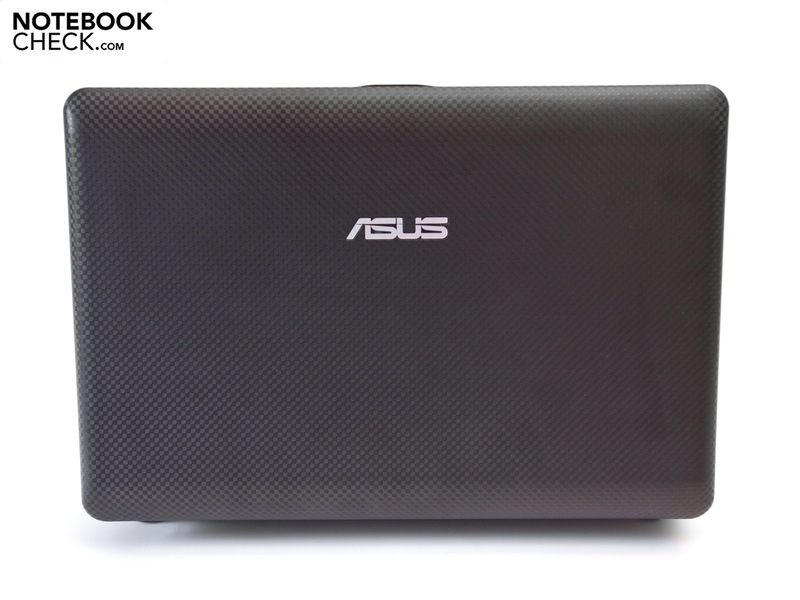 Asus uses Intel's Atom N450 as the processor that has a clock rate of 1.66 GHz. Together with a 1 GB DDR2 RAM and a 160 GB hard disk capacity, the system should supply good office performance under Windows XP. You will, however, have to manage without frills and cool features at a price of 249 euro (RRP). 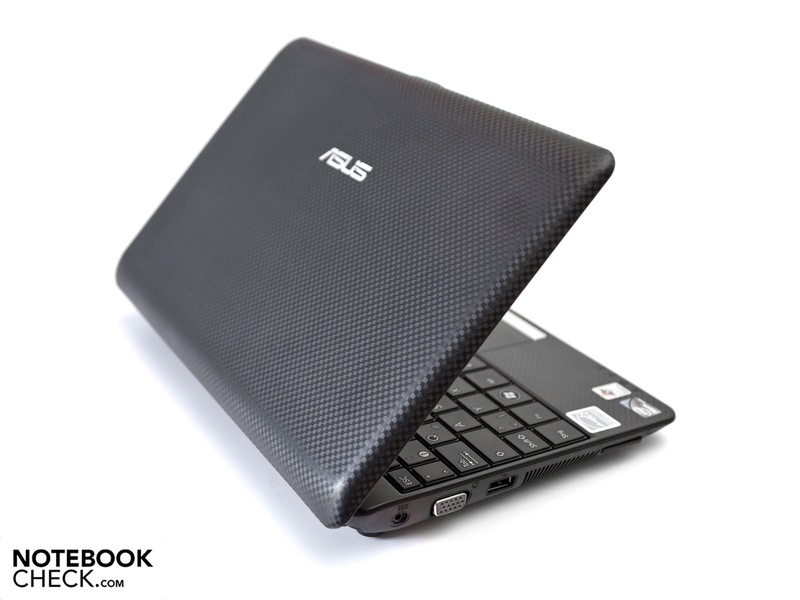 The Asus Eee PC R101 is now available in the World Wide Web in the colors: black and white. Plain, but nevertheless elegant is how the R101's case presents itself. 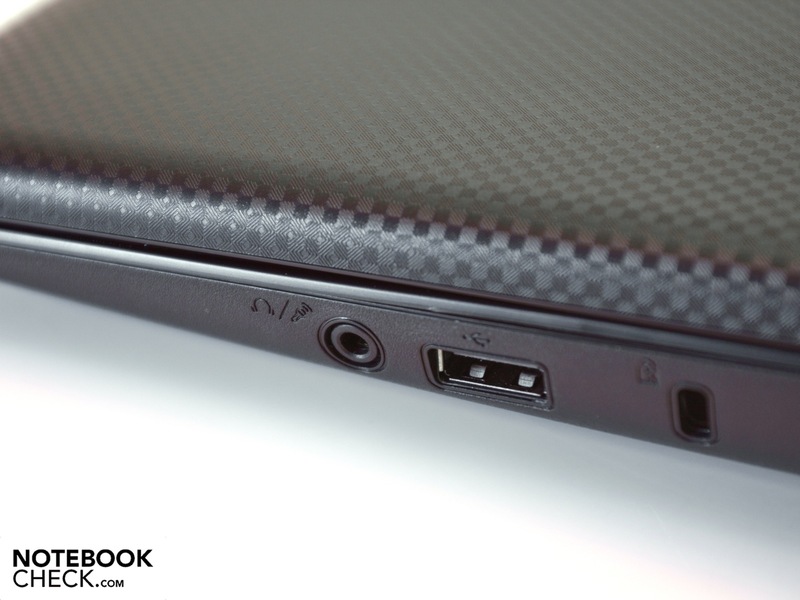 The resemblance to the identically constructed Eee Eee PC 1001P's case is unmistakable. All surfaces are matt and have a pleasant texture made up of many little diamond shapes, whereby the bottom is exempt of any patterns. 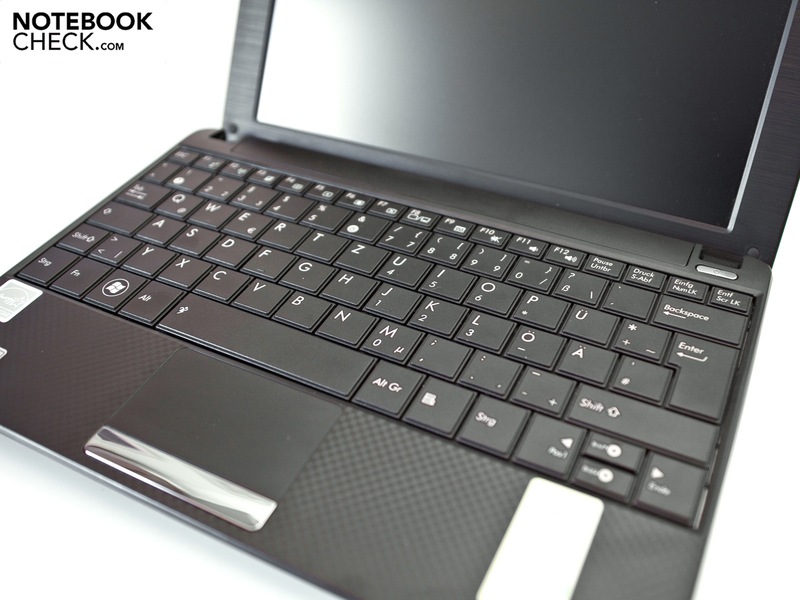 Asus only offers the netbook in black or white, and thus waives on various color alternatives. There are three other colors shown on the carton, which won't be available on the German market. Asus has used the case design consistently and doesn't use any high-gloss parts whatsoever. The design makes an overall balanced impression and is impressing. The workmanship is of high-quality and we can't find any flaws on the case. 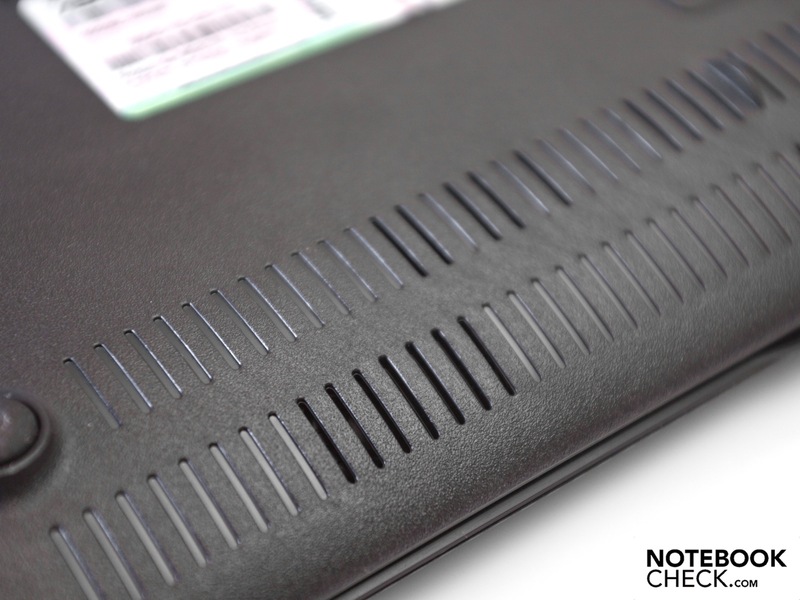 Another benefit of the matt case is its resistance against dust, fingerprints and scratches. 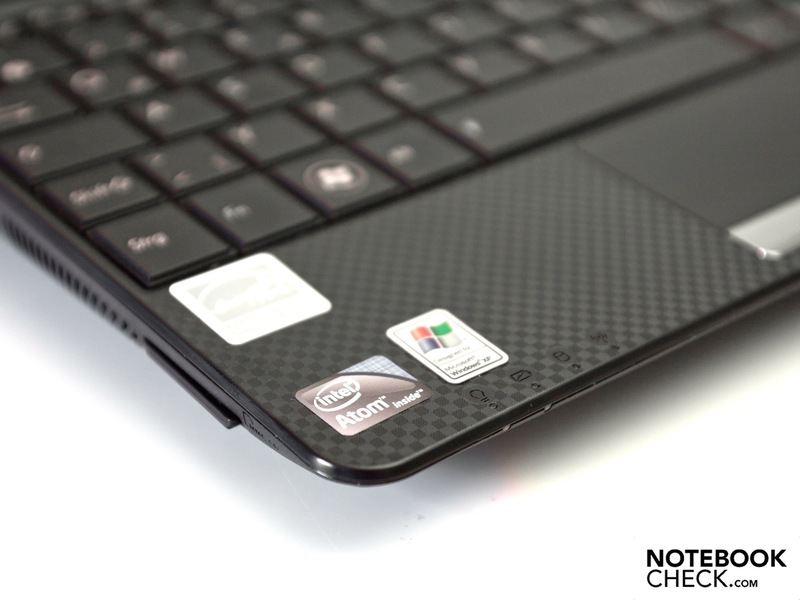 The Asus logo and the chrome bar above the mouse keys provide a nice contrast to the matt surface. The plastic case's stability can convince us. The case only yields marginally under high pressure applied by several fingers. The display bezel is, as usual, very thin, but has a good stability. The display can only be twisted slightly, and we couldn't determine any tension in the display. The small display hinges keep the screen well in the desired position, but we noticed a slight teetering anyway. The case's dimensions and form are known, as Asus has hardly altered them. 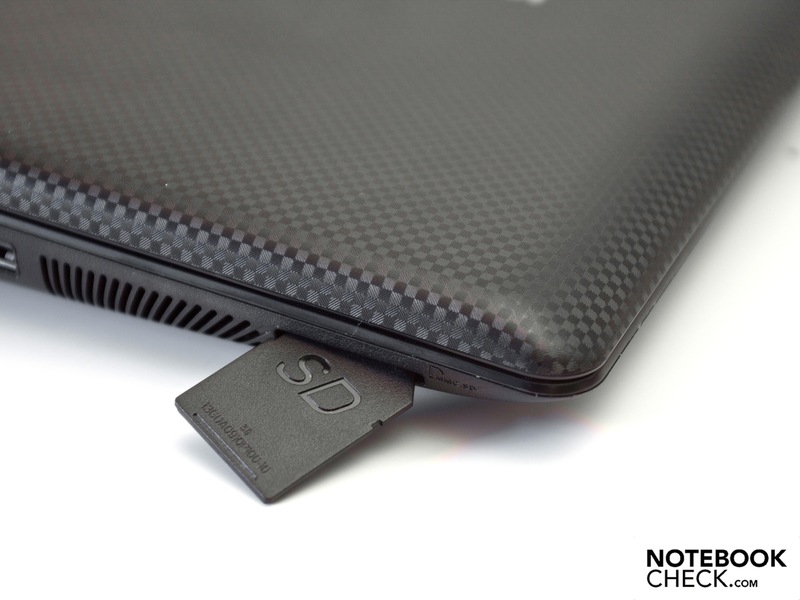 Fortunately, the netbook only weighs 1.11 kilograms at a size of 26.2 x 17.8 x 2.6 - 3.7 centimeters (w x d x h). 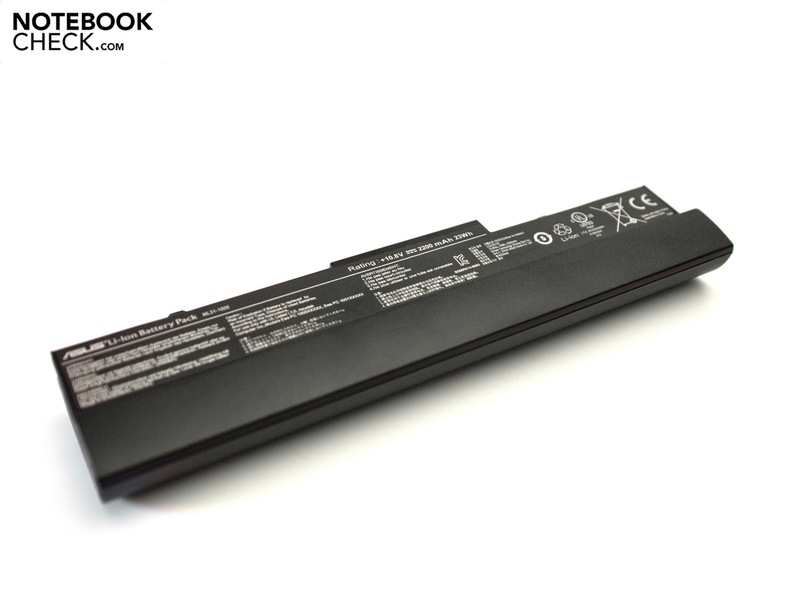 A reason for that is the light 3 cell battery with 23 Wh from Asus. 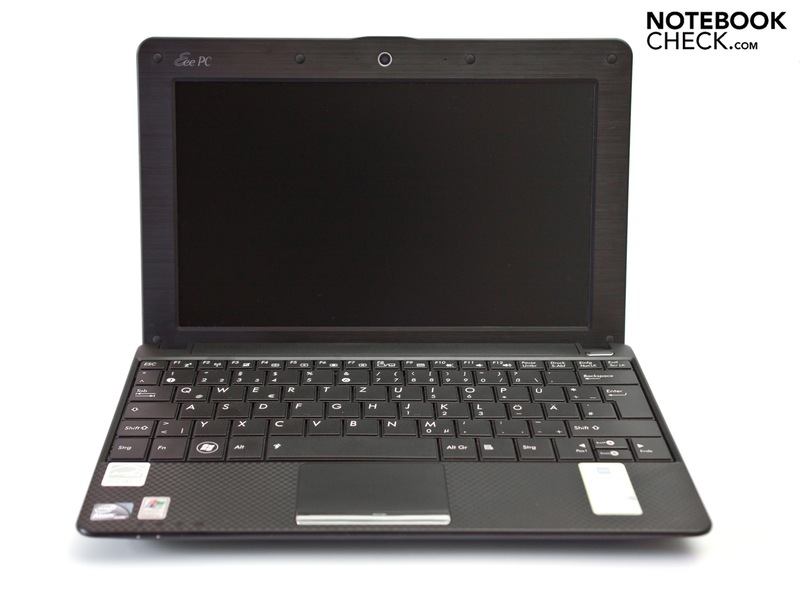 The Asus Eee PC R101's connectivity turns out scanty because a few ports have been left out. A USB 2.0, the VGA-out and a 3-in-1 cardreader that can read and write SD, SDHC and MMC memory cards await us on the left. Furthermore, the power socket and a small vent for warm waste air are also here. On the other side, a further USB port, a Kensington lock, a RJ-45 network connection and an audio connector that combines headphone-out and microphone-in can be found. As usual, the front and rear are free of connections. Instead, two stereo loudspeakers, respectively a small 3 cell battery with 23 Wh are found on these sides. 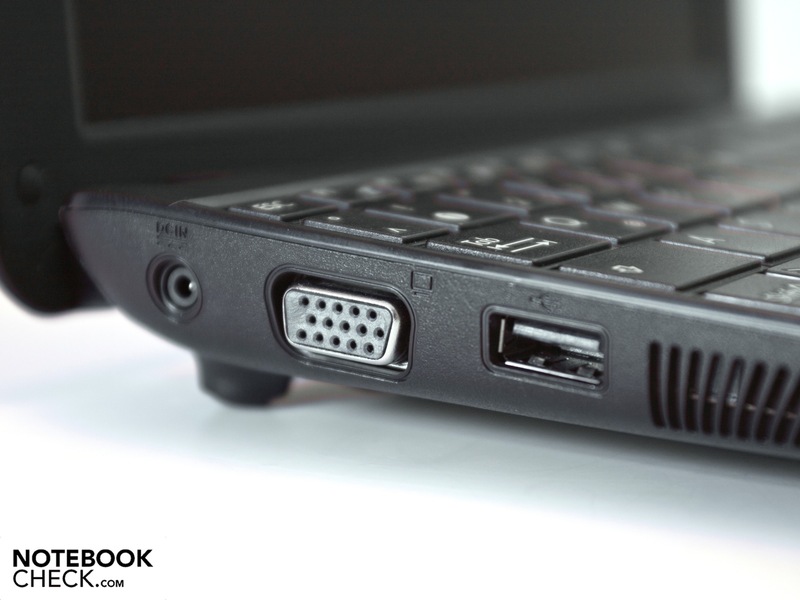 Asus has done a good job with the port distribution, whereby there would have also been room for other interfaces. Two USB ports can be justified at a price of 249 euro, but we would have appreciated a third USB port. The audio connector can't quite convince us either, as only few headsets support this interface. Rear: 3 cell battery (23 Wh). The communication options are limited. Aside from the standard gigabit Ethernet (Atheros AR8132), there is only a WLAN controller with 802.11 b/g standard (Atheros AR2427) integrated. That's not up-to-date and, if required, Bluetooth or UMTS would have to be complemented by a USB dongle. The scope of delivery only includes the most necessary. 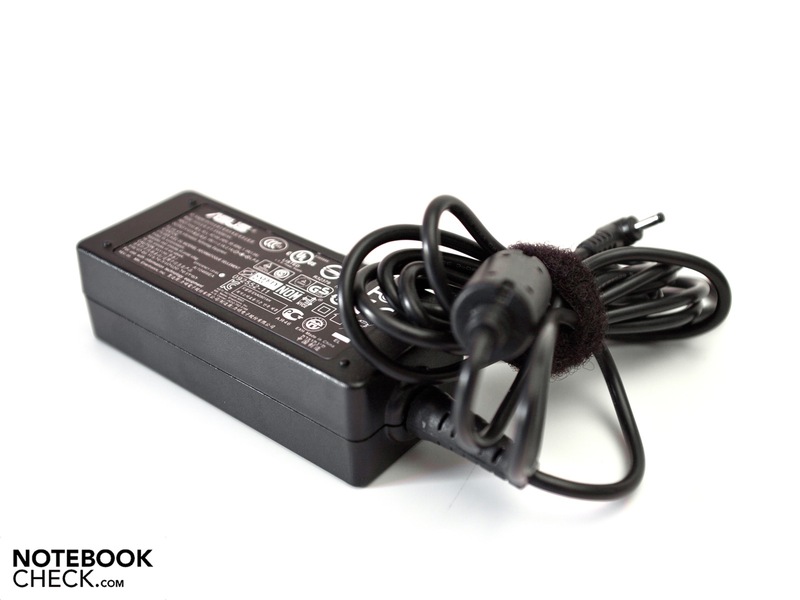 Apart from the netbook, the slim adapter with cable, a brief instruction manual, the warranty card and a 3 cell battery with a capacity of 23 Wh are found. We don't put value on small additions for this starter device because it would only increase the price unnecessarily. 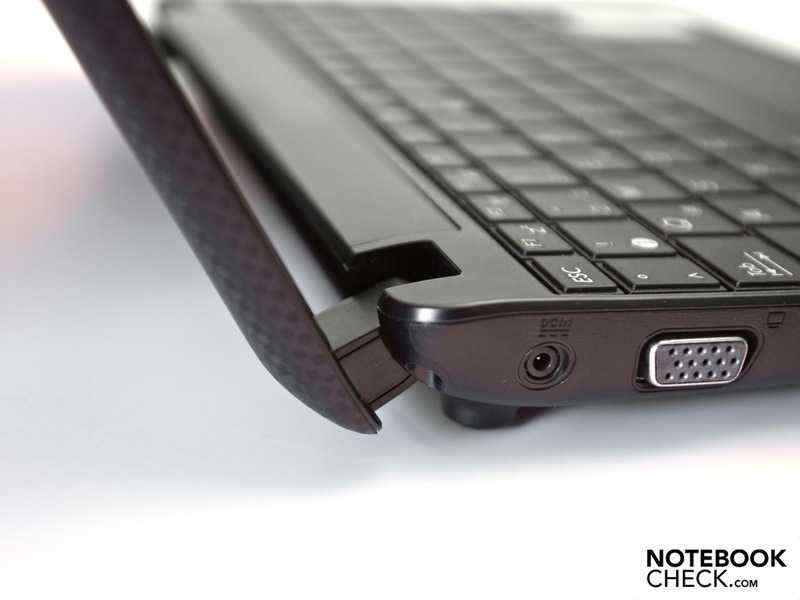 Asus doesn't have a chiclet keyboard for the Eee PC R101, but that's not necessary anyway. 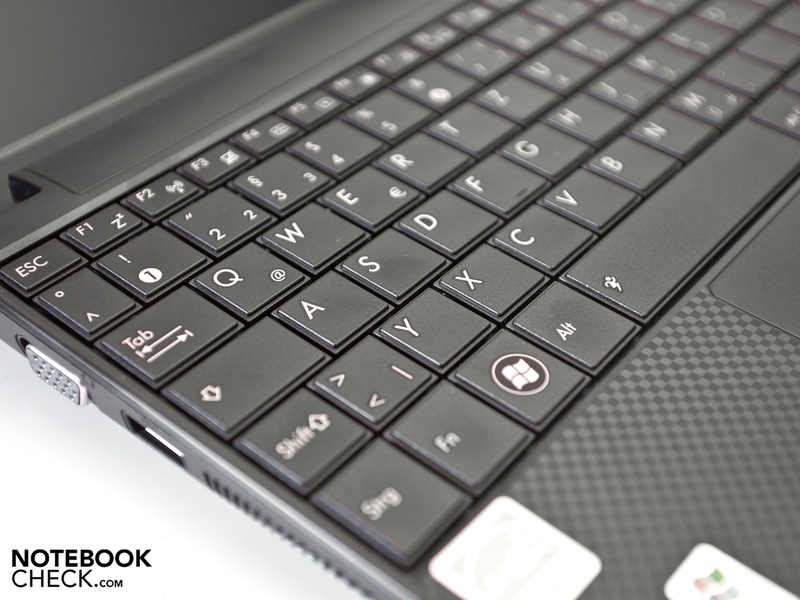 The integrated keyboard has a very comfortable layout with a key size of 15 x 15 millimeters. The pressure point and stroke length are okay and the keyboard's FN functions are highlighted in light blue. Another advantage is the big right shift key, which helps avoid typos. 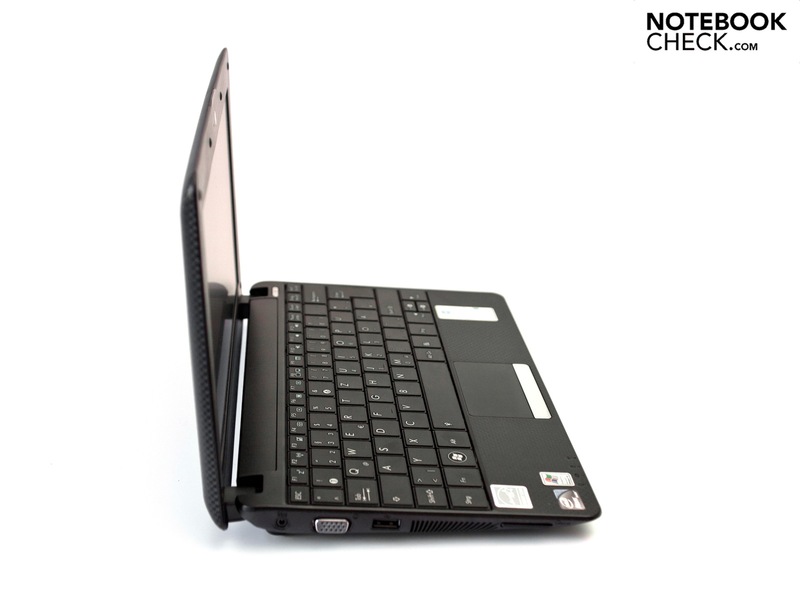 The touchpad in this netbook unfortunately turns out quite small with a diameter of 7.2 centimeters. In comparison to the new Asus Eee PC 1015P, the difference in handling is very striking. 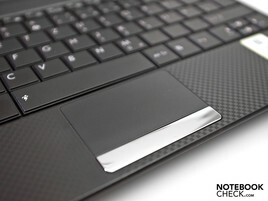 The touchpad is clearly separated from the wrist-rest and has a good haptic, due to the roughened surface. 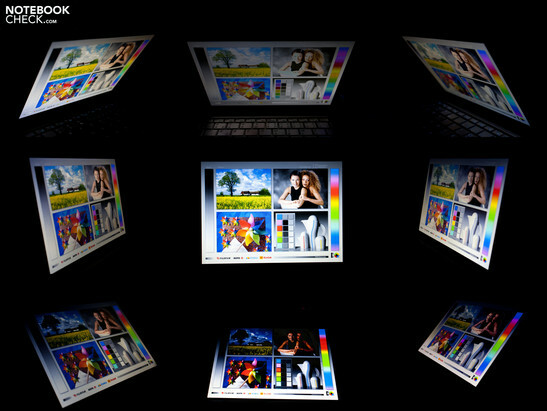 Despite Windows XP as the operating system, various multi-touch gestures are supported and can be used without difficulty. The mouse keys below the touchpad are elegantly hidden and also bid a pleasant pressure point. A device with a matt display that is convincing for 249 euro? Yes. Asus now has an improved screen in the new models that bids a resolution of 1024x600 pixels at a size of 10.1 inches (25.1 centimeter diameter). The screen also makes a maximum interpolated resolution of 1600x900 pixels possible under Windows XP. Unfortunately, Asus doesn't have this screen in a HD alternative with a native resolution of 1366x768 pixels. The integrated LED backlight makes an even illumination of the entire surface possible, whereas it is a high 94 percent in our test device. Another benefit is the display's brightness. We could measure a maximum of 312 cd/m2 in the center and the average is a very good 304 cd/m2. These rates are exceptional for a netbook - and that in this price category. The display's contrast of 918:1 is also in the top field of our test devices due to a low black value of 0.34 cd/m2. The rates we measured provide the best preconditions for a perfect outdoor use, even in intense sunlight. The current heat wave doesn't have an impact on the display. The strong brightness and contrast can assert themselves and the image remains stable even in direct sunlight. The content is rendered clearly and there aren't any reflections to complain about due to the matt surface. Unfortunately, the viewing angle stability isn't quite as convincing. The horizontal plane is very stable up to about 165 degrees and the image displayed is focused and without color falsifications. Only a movement towards a closed state gets problematic on the vertical plane. The image quickly turns illegible and it looks like a negative. However, you basically get a brilliant display with outstanding rates and great benefits for comparatively little money in this device. A low-cost license from Windows XP Home (SP3) and Intel's Atom N450-processor promise a good office performance, since the system needs considerably fewer resources. The Atom N450 normally works with 1.66 GHz in one core, but the "Super Hybrid Engine" developed by Asus increases the clock rate to 1.71 GHz with software. This performance gain is only marginal and we expect more from the energy savings function. Beside the processor, an integrated Intel GMA 3150 graphic unit that has a core rate of 200 MHz, a 160 GB hard disk from Seagate (ST9160314AS) and a 1 GB DDR2 6400 RAM from Kingston work inside the device. The RAM can be very easily exchanged due to a cover on the bottom, but accessing the 2.5 inch drive is only possible by disassembling the case. We would have also liked a maintenance cover for the drive. We checked if the configuration with Windows XP as the operating system looks good with several benchmarks. For this, Windows XP's performance profile "Desktop" and the Super Hybrid Engine's "Super Performance Mode" were enabled. The processor works continuously with 1.71 GHz in one core with this tool. The application performance can be determined with PCMark and CineBench. There were various problems with PCMark05 in our test device, and the latest Vantage version can only be executed starting with Windows Vista. CineBench R10 from Maxon confirmed normal rates for a netbook with this configuration. 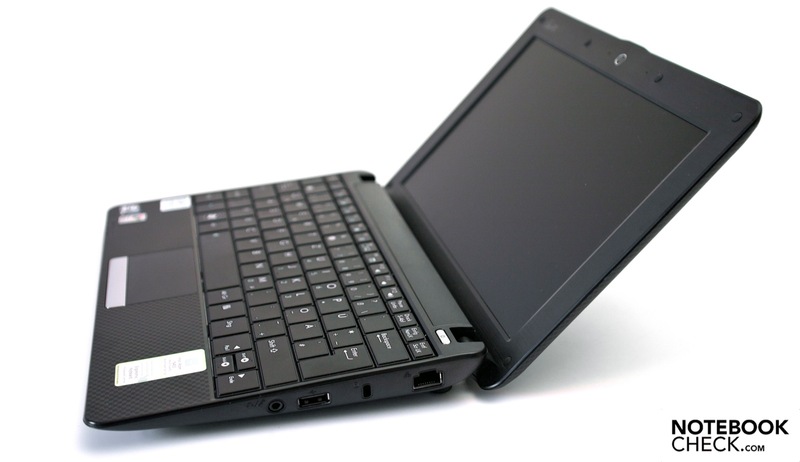 For example, the MSI Wind U160 and the predecessor Asus Eee PC 1001P are on the same level. However, the subjective impression is good and the set up of Windows, as well as the waiting times are convincing. The R101 is also optionally available with Windows 7, whereas we would recommend a 2 GB RAM for it. The synthetic 3D gaming benchmarks from Futuremark confirm a sufficient office performance, but it won't be enough for the latest games. Simple 3D games can be played well, though. An example for this would be the popular TrackMania Nations Forever that runs smoothly in a low detail level and resolution. 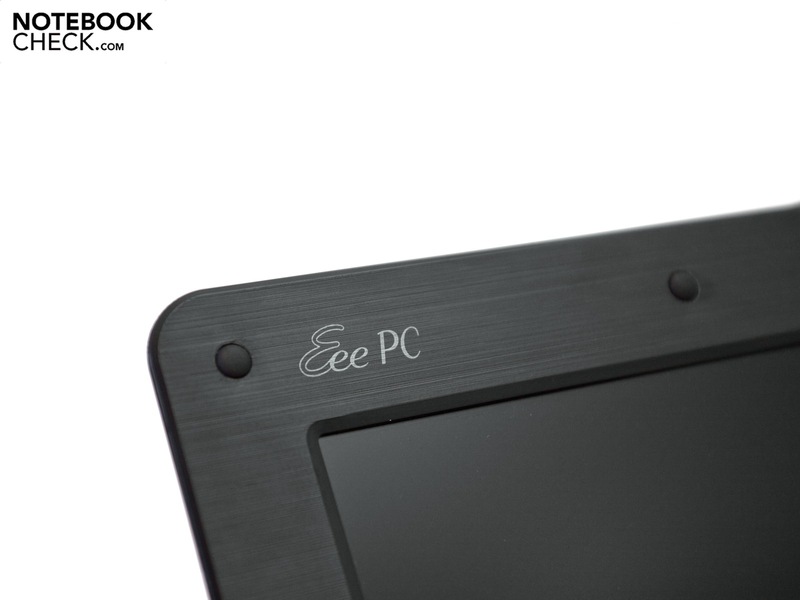 The Eee PC only reaches 156 points in 3DMark06 and is within the range of Dell's Mini 1012 or the Eee PC 1008P. Asus uses a 160 GB sized hard disk in a 2.5 inch format as the memory unit. The drive comes from Seagate and is called ST9160314AS. The tool "HD Tune Pro" offers a benchmark that checks the disk thoroughly. 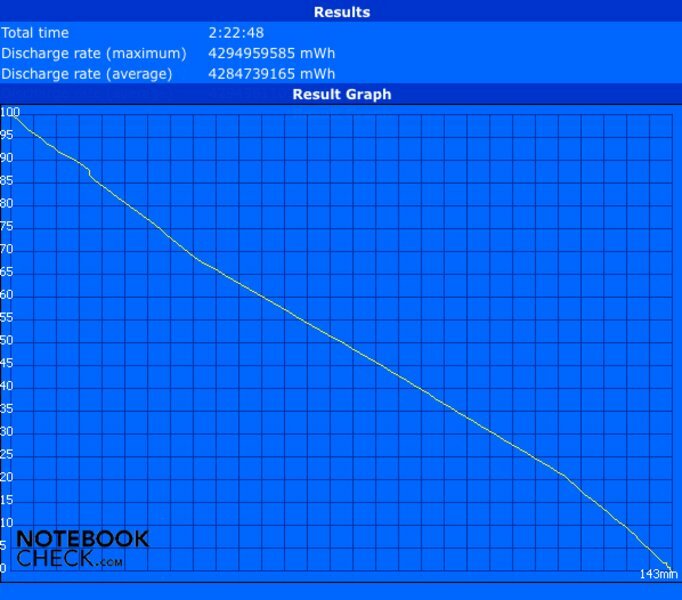 The Seagate Momentus 5400.6 proved to be an average hard disk with acceptable rates after the test. 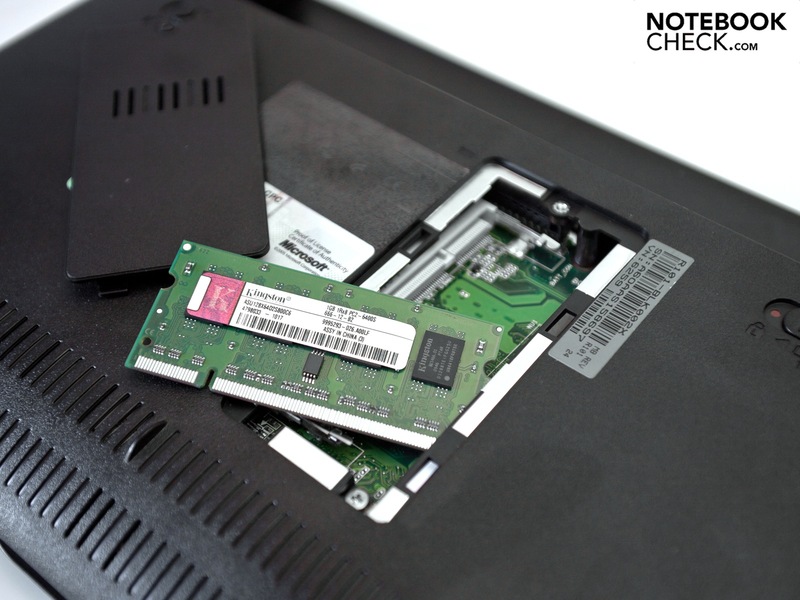 A faster hard disk or SSD can only be built in with difficulty. The entire system is cooled by a small fan. It generally works rather quietly and isn't disturbing. We could measure between 30.5 and 30.7 dB(A) in normal mode, whereas this rate increased to a maximum of 34.6 dB(A) under load. The Seagate hard disk consistently produced 30.5 dB(A) and thus also works quietly. However we could occasionally hear a clacking. A copper heat sink is beside the small fan, which improves the heat dissipation. Overall, the rates are impressive, but the small vent on the device's left traps air, which causes slightly higher temperatures in this area. This area reaches 34.1 degrees Celsius under load. That rate isn't alarming, but you feel the heat on the case. (+) The maximum temperature on the upper side is 33 °C / 91 F, compared to the average of 33 °C / 91 F, ranging from 21.6 to 53.2 °C for the class Netbook. (-) The average temperature of the palmrest area of similar devices was 29.3 °C / 84.7 F (-3.7 °C / -6.7 F). 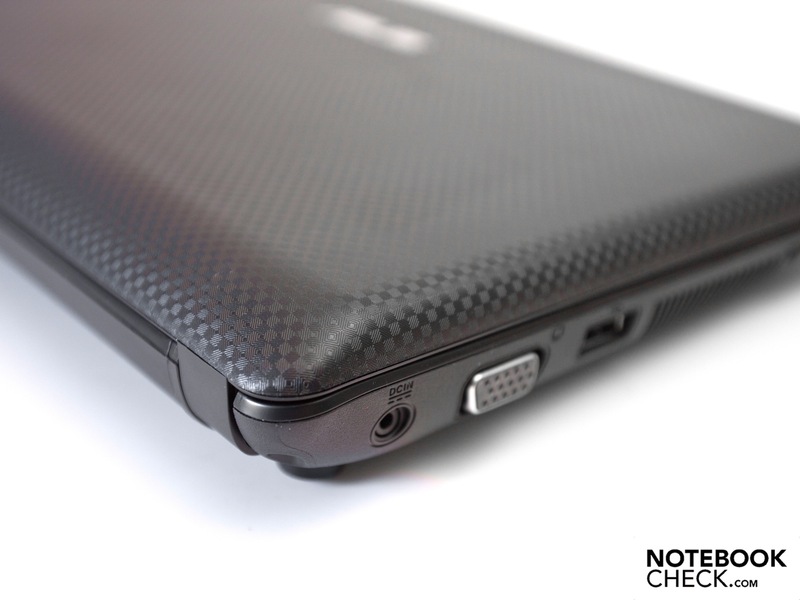 Asus Eee PC R101's loudspeakers are on the case's front bottom and only have an average sound. As so often, we miss the deep pitches and basses, whereby the higher pitches are very present. Only the integrated audio connector, over which headphones or external loudspeakers can be connected, can remedy this. The energy saving Intel Atom N450 with integrated Intel GMA 3150 graphic unit provides good conditions for a long battery life. The small 3 cell battery with 23 Wh upsets this plan. 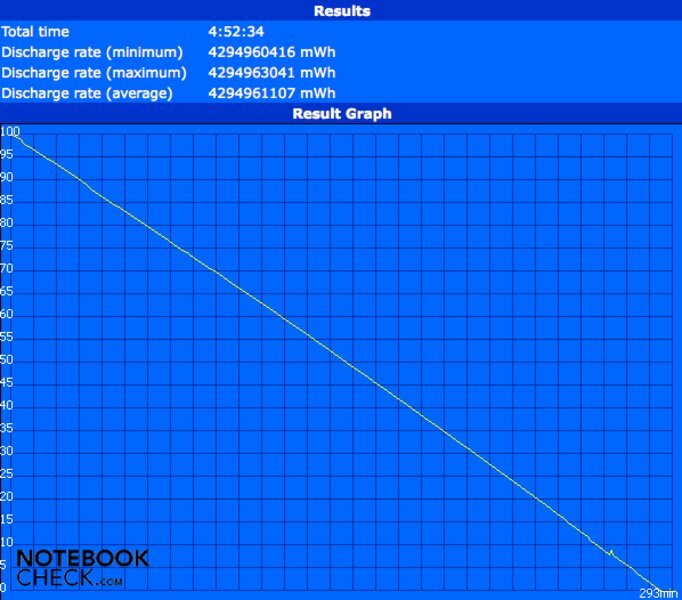 Our device consumes between 5.8 and 10.1 watts in normal mode. These rates increase to a maximum of 14.3 watts under load. The rates in a deactivated state and standby also stay within a limit of 0.4, respectively 0.5 watts. The "Classic" test of the little tool, BatteryEater, determines the minimum battery runtime under load. The OpenGL calculation is executed in "Super Performance Mode", whereby the processor works with the overclocked 1.71 GHz. Additionally, the display's maximum brightness and the WLAN module are enabled. The 3 cell battery is drained after a poor 2 hours and 23 minutes and the mains are needed. If you only want to check your emails and surf a bit on the internet, the Eee PC R101 only leaves you little time with 3 hours and 35 minutes. The processor works with the standard 1.66 GHz in this scene, where a good to medium display brightness is set. The battery life under minimum load and display brightness can be determined with the "Reader's" test. For this, reading text documents are simulated, whereby the processor only works with 1000 MHz. Asus' "Super Hybrid Engine" makes this performance possible. Due to it, a maximum of 4 hours and 52 minutes are possible in this test. Overall, the 3 cell battery only bids an average battery life and a runtime loss of about 50% in comparison to a 6 cell battery. The Asus Eee PC R101, as a starter device, leaves us with a good impression. The high-quality workmanship, the plain design and the ergonomics are convincing, whereas we would have preferred a larger touchpad. The display sets standards for this price category and surprises us positively. The variety of connections and the given mobile technologies comply with the minimum standard, but are sufficient. Known hardware is found inside and the subjective office performance is sufficient due to Windows XP. A drawback is the small 3 cell battery that only has a maximum battery life of 5 hours despite the "Super Hybrid Engine", and thus lags far behind comparable devices. Our test device's emissions are in a green field, but the tiresome problem of poor loudspeakers remains. Overall, you get a refined starter device with a very good, and in particular, outdoor suitable display for 249 euro including added value tax (RRP). 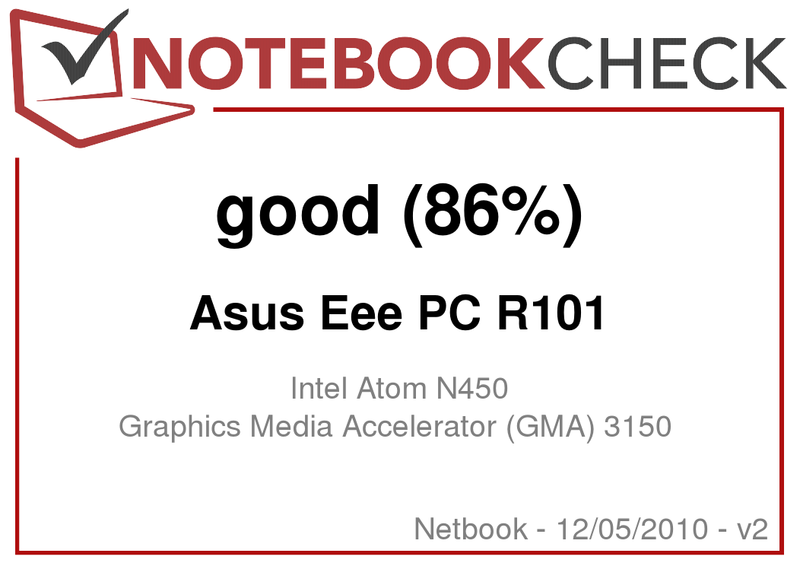 The netbook only missed the rating "Very Good" by a hairsbreadth. The 3 cell battery's short battery life is mainly responsible for that. The highest rating would likely have been cracked with the 6 cell battery. 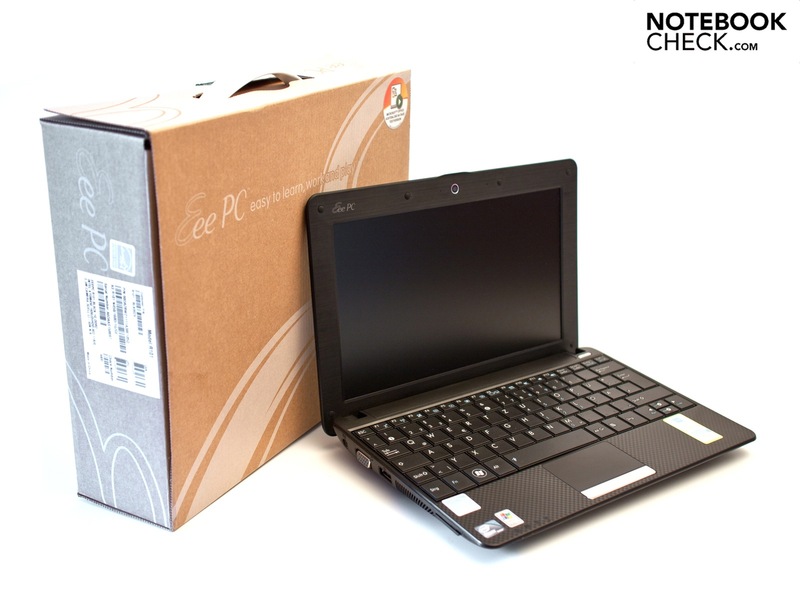 The Asus Eee PC R101 can only be acquired in online shops and is now available in the colors black and white. Asus Eee PC R101: Einsteiger-Modell mit super Bildschirm und Windows XP! We've tested the Asus Eee PC R101 with a 10.1 inch display. Merely a small 3 cell battery is included in scope of delivery. The stereo loudspeakers, as so often, aren't impressive. 1 GB is enough for the older Windows XP Home. The bottom only has one small maintenance cover for the RAM. A 0.3 megapixel webcam shouldn't be left out for video conferences. The mandatory "Eee PC" logo shouldn't be omitted. Intel Atom N450 and Windows XP (SP3) bid a good performance. The keyboard is convincing due to large keys. ... and an audio combo socket. It's also found in the Apple MacBook. the texture and the rounded case remain. ... the plastic surface's high-end haptics are pleasant. The case is slim and well manufactured. The new starter device is matt and has a diamond pattern. The adapter is impressive with its low weight. Undisputedly: the matt, bright display with an excellent image contrast. This poorly illuminated make up mirror, where the brightness wouldn't even be seen as a bad joke. The excuse of various manufacturers that matt displays with good rates are: oh so expensive. 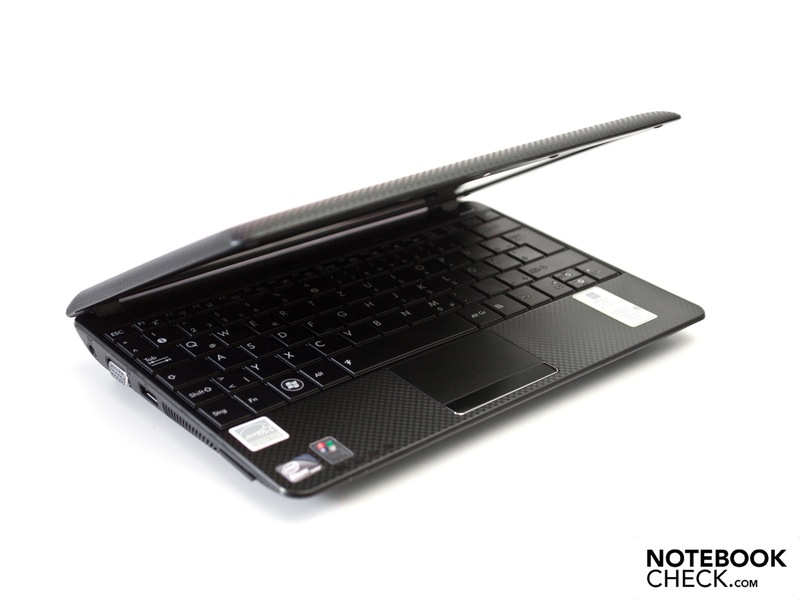 Now an according model is found in one of the most inexpensive netbooks. We would find that embarrassing somehow. 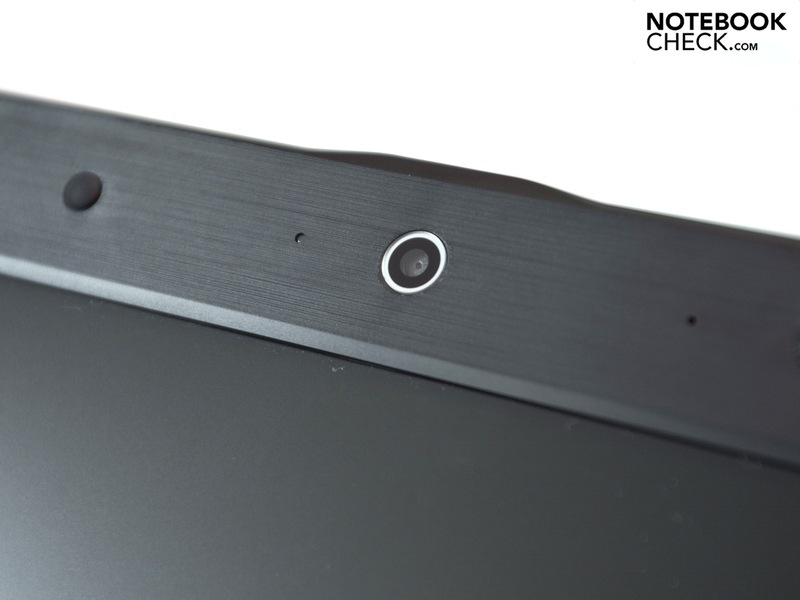 Basically, netbooks with Intel's Atom N450 and a 10.1 inch screen. Among others, for example, the Samsung NP-N230 Strom Netbook, the Lenovo IdeaPad S10-3 or the Acer Aspire One 532. It doesn't look very good if you want a matt and bright display, though. 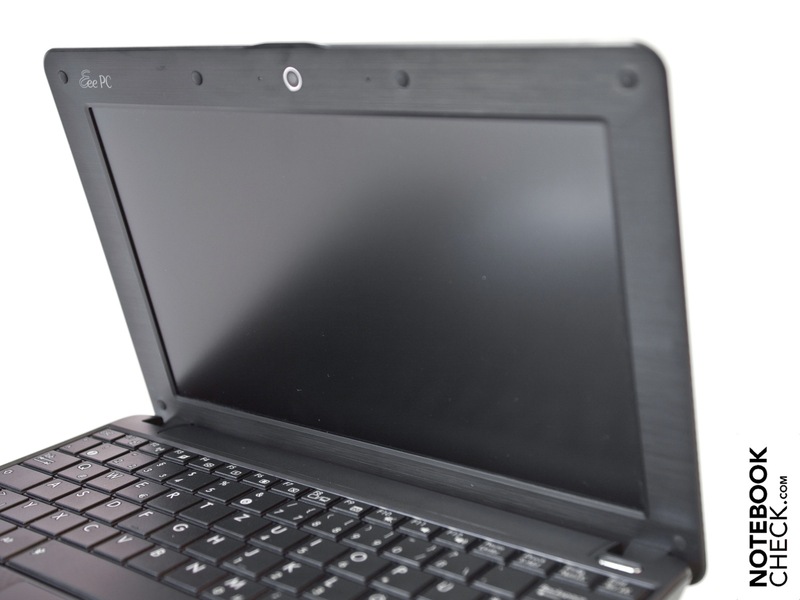 Alternative: Eee PC 1015P.